When your furnace kicks on then shuts off, you naturally ask yourself: what is going on that my gas furnace won’t stay running? Initially before you can figure out what is the matter and troubleshoot it, you must begin to understand the furnace’s ignition system and its workings. In this blog, we will talk about a typical gas furnace’s ignition system, and follow up with five top reasons your gas furnace doesn’t stay on. A direct ignition gas furnace lacks a pilot light so the gas supply goes directly to the burner. The flame sensor positions itself above the burner flame. A standing pilot light gas furnace is manually operated, and you must light the pilot light yourself before the furnace can begin to operate. The problem with a standing pilot light furnace is they are outdated and low-efficiency gas burners. 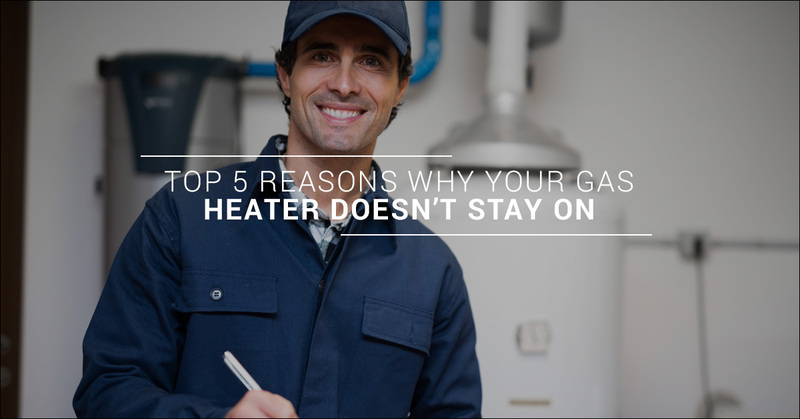 Now you understand the basics of how the ignition system works you can begin troubleshooting the five common reasons your gas heater won’t stay on. The flame sensor’s job is to alert the furnace the gas has been turned on. If the flame sensor cannot discover the flame, the gas supply line cannot be opened and the burner cannot light the gas. The flame sensor might be operating but the problem may be its positioning is wrong and therefore it cannot detect the pilot flame. Call in an HVAC contractor to perform some flame sensor troubleshooting. They will know how to tell if the flame sensor is bad and needs replacement. In this scenario, the burner lights up briefly but then shuts down. A possibility is the gas valve is being dammed up. If the gas valve is completely plugged up it frequently stops the burner from being lit, altogether. If the obstruction is minor the burner can probably still be lit but a deficiency in the fuel supply cannot keep the burner on. Up-to-date gas heaters contain a pressure switch as a preventive measure. It works to sense when your system venting pressure has stopped operating and shuts off the burners so they don’t release lethal fumes throughout the home. But the burners might not be the problem, although it can seem like the burner can’t stay lit. In this case, other problems of a more serious nature such as an obstructed exhaust flue, or broken heat exchangers are possible causes. The thermocouple (a heat sensor) is positioned beside the pilot light. It manages the gas valve by opening it to supply fuel to the burners. If the gas furnace pilot light won’t stay lit, the thermocouple will shut down the gas valve, so gas cannot be released into the home. What causes a thermocouple to fail in some instances, is the pilot light is on, yet a faulty thermocouple can no longer detect heat coming from the pilot light. So, it will close down the gas valve although the pilot light remains lit. Gas furnace burners are the engine which drives the heating of your gas heater and your home. If the burners fail, the furnace can’t produce heat for your home. The most common cause of burner burn-out is carbon build-up. Carbon build-up prevents burners, one or all of them, from running in tip-top shape. An indirect cause of burner failure is a gas line obstruction. This can cause the burners to die out from lack of fuel it needs to ignite.